A traditional story, but told the Serge way. Carlos stood on the sidewalk and looked up at the dark haired girl in the window. Ana. Beautiful, and out of reach. Ana’s father Luis had made it clear that a poor immigrant like him would never be allowed through the front door. He smiled, waved, and walked on. The young man had endured years of gang violence as the unwanted child of an addicted prostitute. He survived without a father, and as a teenager saved up enough money running drugs to escape the brutal poverty of Colombia. He spent that money on a harrowing and dangerous journey to the United States. The kind of trip that doesn’t require a visa. It had not occurred to Luis that a lifetime of such conditions tends to weed out the stupid and the weak. Those that survive are men and women not to be trifled with. Carlos bided his time. 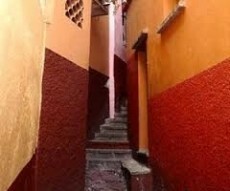 He felt his luck change when the apartment directly across the alley from Ana became available. It was a poor part of town and Carlos and three of his construction amigos could share the rent. There were no hot tubs, built in microwaves, or balconies in these apartments. When you live in a slum, no one refers to the top floor as the penthouse. There were fire escapes with ladders, though. If you crawled out the window, there was a small platform big enough for a person to sit on. That was where Carlos was, a few days after signing the lease and getting settled in. Sitting on the landing, with a bag of dried peas and a drinking straw. He was blowing the hard, round peas through the straw, across the narrow alley toward Ana’s apartment. About every fourth shot was hitting the window, making a distinct sound. Carlos knew it was Ana’s window. Within a few minutes, the young wannabe lovers were wooing each other across the alley, three floors up. Until Carlos heard an angry voice in the background. As Ana turned away from the window, Carlos could see the fear in her eyes. The window closed. Moments later, he heard Carmen, Ana’s mother, say in a loud voice, “Suficiente! No más!” Enough! No more! The hair stood up on the back of Carlos’ neck. He went back in the apartment and started thinking about what to do next. He’d seen bruises on Carmen’s face the day he moved in. He had an idea what Ana looked like right now. Carlos trusted his construction brothers. There is a code of conduct in his world. A man who strikes a woman in anger is not a man and his rights are forfeit. Angel was the best climber Carlos had ever seen. At 5 feet and 95 pounds, from a distance you might think he is a child. That would be a mistake. There was no piece of equipment too heavy for Angel to carry, regardless how flimsy the ladder or how high. And he was the quietest, calmest human being Carlos had ever met. Angel could spend an entire evening in a crowded bar, and the next morning, none of the other customers would remember he was there. Which made Angel the perfect tail. It didn’t take long for Angel to figure out that Luis liked to spend his paycheck at a local dive called Rosie’s Tavern. Angel became a fixture at the end of the bar at Rosie’s. He sat quietly, drinking beer and puffing on cigars. When he saw Luis walking to the door, he sent a brief text message to Carlos. It always consisted of a single number. If it was two or more, the plan was off for the evening. That was the number of people leaving the bar at the same time as Luis. The number Carlos was interested in was one. Also, there had to be no witnesses in the parking lot. It took three weeks of waiting for the right moment. Luis never saw the Taser coming. When he woke up, he had no idea he was inside the maintenance shed at Nash Construction. After his senses returned, he realized he was inside a cage made out of eight foot high chain link fencing. And he was facing a man wearing a professional wrestler’s mask, the kind the bad guys wear. Carlos. The bell rang. Carlos put his shoulder down and ran full speed into the other man. They tumbled to the ground and began grappling. Luis was bigger and stronger. But youth can make a difference in a fight. Also, just before Carlos had laced up his mask, Angel had shown him the pictures he had taken on his cell phone. The ones of Carmen and Ana after Luis had worked his magic on their faces. Carlos was a man on a mission. He unleashed his inner beast. The older man put up a good fight but began tiring after a couple of minutes. One solid punch was enough to shatter Luis’ cheek bone. Concrete is hard. The blow bounced his head off the floor with enough force to take the rest of the fight out of him. Carlos stood, and put one foot on Luis’ right wrist. Then stomped his other foot down on the man’s hand as hard as he could. Carlos felt bones breaking under his heavy construction boots. Luis screamed. Luis got tasered for the second time that evening. A few minutes later, he woke up in the alley behind Rosie’s Tavern. That was phase one of Carlos’ plan. He knew it was a matter of time before Luis returned to his abusive ways. Monsters always do. The next morning, the crew started working on phase two. Over the next week, various pieces of scaffolding and parts of an old bucket lift made their way into Carlos’ apartment. The construction company he worked for had been in business for several generations, and had a large boneyard at the back of their lot. It was filled with broken and old equipment. Occasionally Carlos would roam through the lot to find replacement parts for the heavy gear that always needed repair. Last payday, the owner was more than happy to compensate Carlos with used equipment and parts instead of money. After working at the construction site, Carlos and his amigos spent their evenings assembling an odd looking contraption just inside the window of their apartment. It took two weeks of assembly, testing, and trial and error. When they were ready, when all the lights were out on both sides of the alley, they conducted a dress rehearsal. The old but well-oiled bucket mechanism slowly moved across the alley and stopped just before it reached Ana’s window. In its previous life, a diesel engine drove the bucket lift. On this job site, it was powered by a homemade wooden crank, sized for two men to turn at the same time. They had replaced the bucket with a platform. Small enough to fit through the window. Large enough for two people to sit on. They reeled the platform back. The test was done. It was go time. Angel and Pedro muscled the crank as Carlos slowly moved across the alley, three floors up. The dim yellow haze from the streetlights below did not reach him. He crossed the gap in silence and darkness. The Taser in his back pocket was for insurance only, in case she said no. He wasn’t planning on getting back on the bucket lift alone. It stayed in his pocket. A few minutes later, the newly engaged couple were in Carlos’ car, heading toward the interstate. Mr. Nash had given Carlos the names and addresses of several construction companies he’d done business with on the West Coast. Angel and Pedro dissembled the bucket lift, and loaded the parts into the van. Pedro drove to the boneyard and unloaded. When he got back to the apartment, Angel had finished patching the walls. It did not take long for the two men to give the room a fresh coat of paint. The van hit the road three hours behind Carlos and Ana. The team reunited that evening. In the morning, they resumed their journey west, to a new home, and a new beginning. Ana sat with a smile on her face, and asked Carlos how many children he wanted. Carlos squirmed in the driver’s seat, and realized he was probably in over his head. Hahahaha! I loved the ending. Carlos was certainly a modern day Romeo. Incredibly creative and knew how to get what he wanted. Took a lot of work to get that Ana girl. Hope she was worth all the trouble. At the end of the story, he is realizing that the challenge he faces next will be much more complicated than all he has gone through so far. And he'll have to use his brain and his heart from now on. He knows fists are for bullies, not for wives and children.